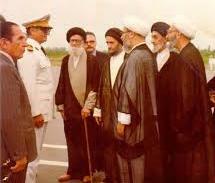 In the era which the current rulers of Iran consider as the period of evil power, religious scholars had enough freedom and independence in order to publish and develop their religious thoughts, and the political regime was not disturbing them. The Islamic sources were able to conduct their research and preaching, and apart from Khomeini, they did not face a significant opposition. During that period of time the country’s leader would pay his respect to the highest ranking scholar of the nation, and would show that spirituality is placed under the auspices of politics. During that period of time, the father of our teacher, Seyed Mohammad Ali Kazemeini Boroujerdi, established the school of thought and ideology of “Maktab Noor” (Noor doctrine) at the Noor mosque in Khorassan square, in Tehran, and was freely conducting his spiritual activities. However, his son, Seyed Hossein Kazemeini Boroujerdi, has been wandering in various prisons since twenty five years ago as his punishment by the current Iranian regime. During this long period of time, the Hemat Abad mosque in Moniriyeh, that had been conferred on him by Ayatollah Seyed Mohammad Golpayegani in 1980, and had become a great place for the promotion of monotheism without violence, was taken away from him, and he was taken to a secret and horrific jail. Then they confiscated the Noor mosque in Khorassan square, which had been given to his father by the grand Ayatollah Boroujerdi, sixty years ago, and created daily barriers on his path for conducting his teachings; however, the works which have remained from this teacher, are embedded in his students and will move forward in history.